It really hurts to have to write a not so great review for a Tony Levin CD. 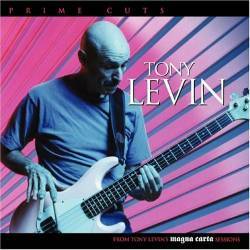 Levin is without the least doubt the world's most versatile bass guitarist. Nearly 60 years old, the moustachioed bald-headed bass player was a prominent member of the Peter Gabriel Band, and also helped King Crimson from the Eighties on to define a contemporary progressive sound. Prime Cuts is a new series of album by Magna Carta Records, where they exhibit their most interesting recording artists on a single CD. What worked wonderfully with drum wunderkind Terry Bozzio fails with Levin, and that only because Levin has only been involved in a couple of Magna Carta albums, notably the instrumental Liquid Tension Experiment (Levin together with Dream Theater members) and Bozzio Levin Stevens (Levin with previous Prime Cutter Bozzio and Billy Idol guitarist Steve Stevens), as well as on the Gardner brothers' Magellan, the latter being somewhat out of place on this nearly instrumental album. That's why there are only six, mostly long, tracks on the album, where three are really great (twice LTE, once BLS), Magellan is ok but works better on an entire album, plus there is a not so cool remix and an unreleased track recorded with Terry Bozzio that is mostly uninteresting because it's way too experimental. Maybe starting with an album by the Tony Levin Band is a better way to get introduced to this truly amazing artist, but essentially you should go out and buy some of the records he is involved with: Liquid Tension Experiment, Bozzio Levin Stevens as the stuff he did for Magna Carta, and of course everything he did with King Crimson. Prime Cuts itself would be more interesting if at least it were released as a special priced album. Now I am just wondering what CD will come next. How about the prolific Gardner brothers?